When working in our industry you have d oubtless encountered a customer with a half full plate posing the sticky question, “Can you wrap this for takeaway?”. While there is nothing in the provisions of the legislation that says you can’t, this scenario is something of a loaded gun for venues. Celebrity Chef George Calombaris recently made headlines about asking a customer wanting to bag up his leftovers to sign a waiver before leaving his restaurant. Again, while not a legislative requirement, Mr Calombaris was completely within his rights to ask for that provision. While asking for a signed waiver is a useful addition to your venue’s records, if you cannot prove to the inspecting body that food was safely prepared before it was taken from the premises, that waiver will be about as useful as a prenup! The main risk associated with providing food leftovers (doggy bags) is the lack of temperature control. The temperature of food is directly related to the growth of dangerous bacteria that cause food poisoning. These bacteria grow best in the ‘Temperature Danger Zone’ which is between 5°C and 60°C. 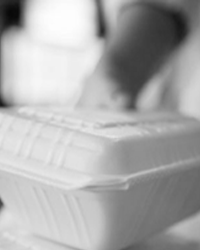 Food items taken away in a doggy bag are usually in this danger zone and are then eaten several hours or even days after the food was prepared. To reduce the risk of food poisoning, instructions should be provided to your consumers, to ensure that the risk of this occurring is minimised as far as practicable. While having a ‘no Doggy Bag’ policy may deter most patrons from asking for their leftovers, you cannot refuse this request citing food safety legislation. In fact, a customer can demand their leftover food. It should be noted that the food business is in no way obliged to provide a container for the food. While this is true, this may not reflect well on your business, particularly if the customer makes a scene. Rather than risk this, follow the simple guidelines below, to ensure correct instruction is provided to your customers so that the likelihood of food spoilage is minimised. Determine a policy for providing leftover food to consumers and properly instruct your staff on your policy and procedure. Remind them that food safety legislation rules cannot to be used as an explanation for not providing doggy bags. Have a set procedure for dealing with customer requests to take leftover food home. Transfer food into a new, unused food grade container, (customers can provide their own). 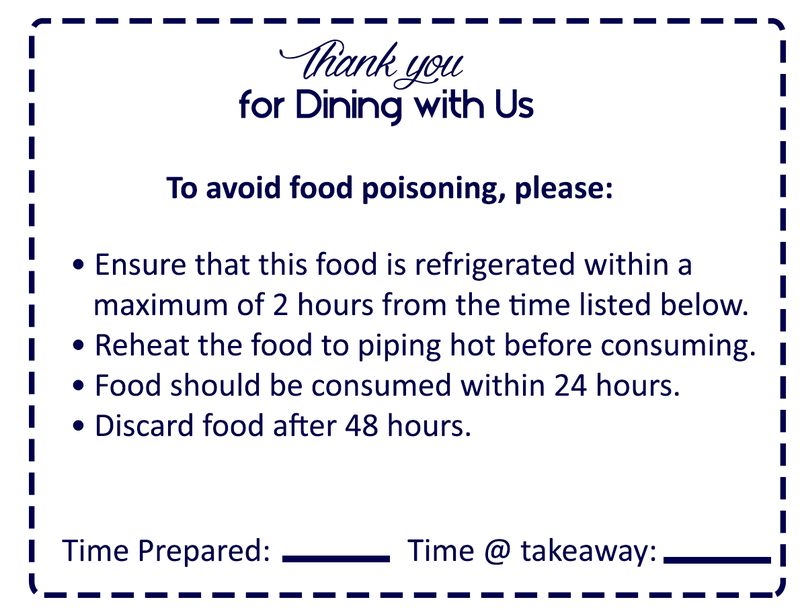 As a minimum, write the date and time of food preparation on the container and the time it was packaged for takeaway.